A serial port with a RX and TX line works in asynchronous mode as there is no common clock on the transmitting and receiving sides. Synchronization is done by adding an extra start and stop sequence to re-synchronize both individual clocks. This only works though when both sides are on the same transmission speed. 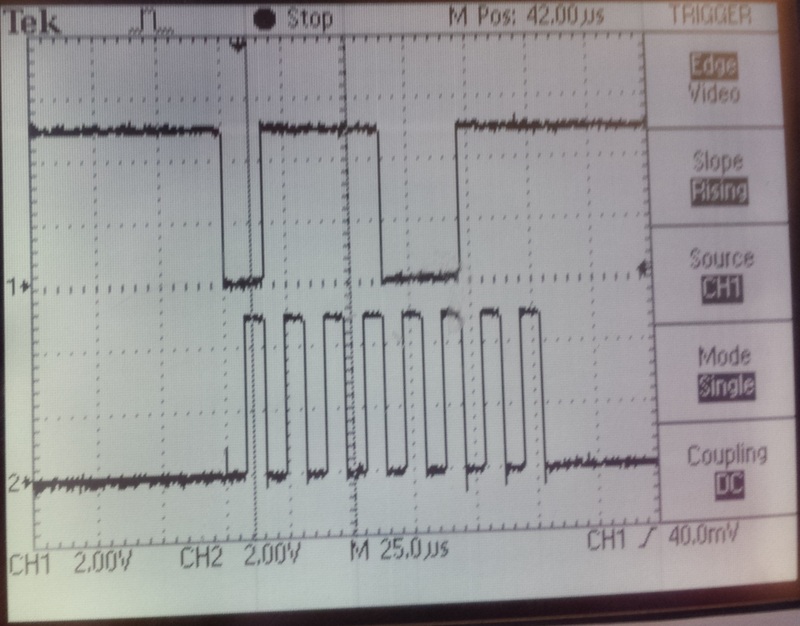 SPI is a synchronous data bus as there are two data lines (MISO and MOSI), one clock line and a slave select line. The side generating the clock signal is usually the master and attached devices are called the slaves. When the master wants to send data to the slaves, it simply puts the information on MOSI (Master Out / Slave In) line. Slaves can communicate with the master over the MISO (Master In / Slave Out) line while the master continues to generate a clock signal. The slave select line is usually used for the master to talk to a particular slave only. The first channel is wired to the data line and the second channel is wired to the clock line. The data transmitted is 01110011 in binary. 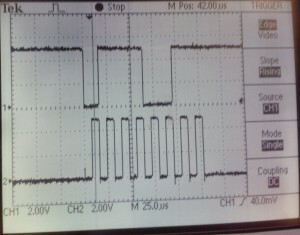 The benefits of a hardware SPI is that the clock signal is generated automatically when the master initiates a transfer. Data is also shifted out on command and an interrupt can be generated when the SPI is ready for the next byte to be transmitted. In this project, the 68HC11 acts as a master and the dot matrix display acts as a slave. The slave select line is not implemented as there is only one slave. So that line is just pulled low for the same slave to always be selected. There is no need for feedback from the slave so the only data line implemented is the MOSI line for the microcontroller to send display data to the dot matrix.